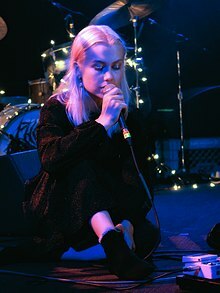 Phoebe Bridgers (born August 17, 1994) is an American musician. Bridgers released her major label debut 7" Killer on Ryan Adams' record label, PAX AM. In early 2016, Bridgers supported Julien Baker on her 2016 East Coast tour. In June 2017, Phoebe Bridgers signed to Dead Oceans. On September 22, 2017, she released her debut album Stranger in the Alps to generally positive reviews. The album was produced by Tony Berg and Ethan Gruska. On March 12, 2018, the social networking site Pebbal named Stranger in the Alps the best album of 2017. Phoebe Bridgers appeared on CBS This Morning: Saturday and sang "Motion Sickness" and "Scott Street", on March 3, 2018. In 2018, Bridgers along with Julien Baker and Lucy Dacus formed the supergroup boygenius. They released three songs in August 2018 and subsequently announced an EP and a tour. The EP, titled boygenius, came out on October 26, 2018. Baker and Bridgers had formerly performed onstage together at various concerts. Bridgers' song "Safe at Home" was featured on season 3, episode 5 of the ABC Family show Switched at Birth. Season 3, episode 17 of the show featured her song "Ask Me To/Steamroller." Her song "Georgia" was featured on season 8, episode 2 of the ABC show Castle. The track "Smoke Signals" appeared on season 1, episode 7 of Burden of Truth. Her song "Funeral" was featured near the end of season 3, episode 2 of the FOX show Lethal Weapon. In May 2018, Bridgers was featured on a remake of the Lord Huron song "The Night We Met" for the soundtrack to season 2 of the Netflix television series 13 Reasons Why. She and Conor Oberst revealed their new band Better Oblivion Community Center on the Late Show with Stephen Colbert and released their eponymous debut album in January 2019 (out via Dead Oceans). They appeared on CBS This Morning Saturday on January 26, 2019. They were interviewed and performed "Dylan Thomas" and "Didn't Know What I Was in For." The show ended while performing "My City." Bridgers is a graduate of Los Angeles County High School for the Arts, having studied vocal jazz. She is bisexual. ^ "Julien Baker, Lucy Dacus and Phoebe Bridgers of boygenius Deliver a Tender Show in Los Angeles". The Fader. December 14, 2018. ^ Armstrong, Chuck. "Phoebe Bridgers on Working With Ryan Adams (Who Compares Her to Bob Dylan)". Diffuser. Retrieved 12 June 2016. ^ Grant, Kimberly. "Newcomer Phoebe Bridgers Releases "Killer." a New 7" Produced by Ryan Adams on Pax-Am". No Depression. Retrieved 12 June 2016. ^ Vain, Madison. "Stream Phoebe Bridgers and Daniel Clarke's new Pax-Am 7-Inch Series releases". Entertainment Weekly. Retrieved 12 June 2016. ^ "Phoebe Bridgers: Killer". KCRW. Retrieved 12 June 2016. ^ "PHOEBE BRIDGERS: KILLER". FrostClick. Retrieved 12 June 2016. ^ Claro, Allison. "Julien Baker Closed Out Her East Coast Tour with Phoebe Bridgers & Petal to a Sold Out Crowd at NYC's Bowery Ballroom on April 27, 2016". Zumic. Retrieved 12 July 2016. ^ Bidiman, Craig. "Sad Songs Make Artist Julien Baker Feel Better". The Mass Media. Retrieved 12 July 2016. ^ "Phoebe Bridgers Signs to Dead Oceans; Debut Album Coming Soon". DeadOceans.com. Retrieved 2017-06-06. ^ "Reviews and Tracks for Stranger in the Alps by Phoebe Bridgers". Metacritic.com. Retrieved 2017-09-27. ^ "The 65 Best Albums of 2017". Pebbal.com. Retrieved 2018-03-12. ^ "Julian Baker, Lucy Dacus, Phoebe Bridgers Form Boygenius, Release Three Singles From EP: Listen". Billboard. Retrieved 22 February 2019. ^ "Music from Switched at Birth S3E05". TuneFind. Retrieved 2017-01-03. ^ "Music from Switched at Birth S3E17". TuneFind. Retrieved 2017-01-03. ^ "Music from Castle S8E02". TuneFind. Retrieved 2017-01-03. ^ "BETTER OBLIVION COMMUNITY CENTER: Phoebe Bridgers & Conor Oberst Surprise Drop Long Rumored Debut #Album". Music News Net. Retrieved 22 February 2019. ^ "Phoebe Bridgers Chart History: US Independent Albums". Billboard. Retrieved April 16, 2018. ^ "Why L.A.'s Phoebe Bridgers has everybody talking". LATimes. Retrieved 2017-01-31. ^ "Phoebe Bridgers Embraces Her Inner Sext Machine". BeatRoute. Retrieved 2019-02-16.